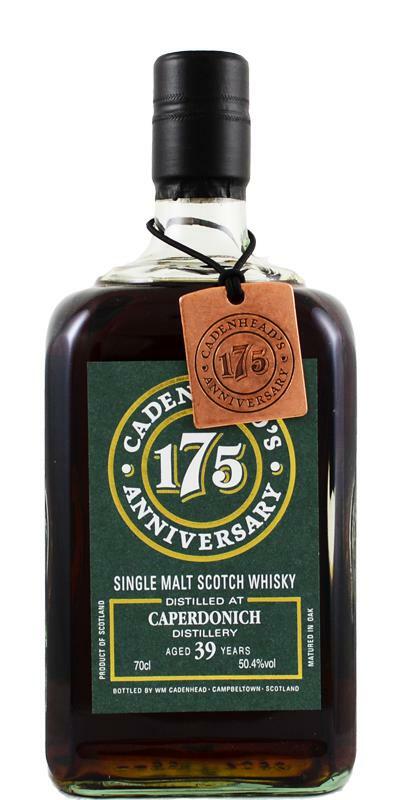 [May, 2017] I had this dram during the Cadenhead 175th Anniversary tasting in Campbeltown. This is fantastic! Much better than the Caperdonich 1977 35 year old, and that one was already quite good. There is no bitterness here, and it’s very well balanced. A lovely winterdram with lots of layers. And one to enjoy for a long time while sitting by the fire. Yup, a sherry bomb indeed! A mixture of dried fruits and forest fruits, like raisins, blueberries and blackberries. Some wax, a hint of oak and leather. Very restrained at first though. But after giving it a bit more time this gets better. Then ginger bread. Dark chocolate and a tiny hint of citrus. A very thick mouthfeel, quite creamy too. Sweet fruits and honey! Strawberries, cherries, blueberries and blacberries again. Ending with tobacco and sweet winter spices; aniseed, ginger, cinnamon, a touch of black pepper and cloves. So very nice! Later dark chocolate too. Quite delicious and maybe even a bit better than the nose. LONG! With chocolate and the above mentioned spices. Date, raisin, cherry and melon. Date, raisin, cherry, melon and a little cheese. Raisin, date and dark chocolate. N: dried blueberries, cocoa powder, leather, cinnamon, roasted nuts, deep and rich. F: deep rich sherry, mint, not as bitter as expected, dry and dark chocolate. Really nice old school dram. very acidic and adstringent, but not unpleasant. Mouth-coating, there is quite some oak but not overwhelmingly much. Doesn't reach the complexity of the nose. Plums & sultanas. Nice old sherry in the nose, very yummy and fruity sweet in the mouth. Long sweetish finish. Reminds me easily of an old grain. High Quality - very good whisky! As expected, also a delicious droplet. It combines the typical sherry aromas with proper age. But that is certainly not for wood allergies. I like this. He definitely has more sherry than the WID: 21006. Of course that's no surprise with the color. Wild berries. Figs. Plum jam. Chocolate grape nut. Some citrus fruits. The oak is also noticeable. But you just notice the age compared to younger sherry bombs. This brings the typical notes much more relaxed and set over. In the mouth again the typical red fruits (see nose). They become more and more acidic over time. Sour cherry. Then blood orange. The oak is now much more present than in the nose. It is getting drier. Coffee and dark chocolate. Some fruit. Tobacco. Cocoa. Liquorice. Wow, one of the best I ever had. He perfects a distillery, which in itself I feel as one of the 3 best of all time, the age is perfectly matched, everything went together 100%.